The first time I heard Cat Power's 1998 album Moon Pix I was struck dumb. From start to finish, I was spellbound for the first four or so listens (all in quick succession). Still, years later, I put the album on and am entranced by the cracked fragile voice, the barely there instrumentation, the wash of samples and loops, and the amazing poetry. I love that album, and because of it Chan Marshall always gets the benefit of the doubt. After my first attempt to see Cat Power caught Marshall on a bad day, I had a second musical epiphany, when, sat in a North London chapel a couple of years back around the time of the patchily brilliant You Are Free, the singer opened her mouth a few feet in front of me and filled the church (no mean feat) with an amazing, large, accomplished soul voice. That gig remains one of my favourite live music experiences and for providing me with two milestones as a music fan, I always want to love everything this woman does. Featuring legends of southern soul and recorded in Nashville, The Greatest sees Marshall transformed from the confessional stream-of-consciousness songwriter who recorded two albums of punk-folk rants in one day with members of Sonic Youth a decade ago. Glossily produced, the new album is much less thorny than Marshall's earlier works, showcasing the artist's songwriting and soul singing talents. The title track, which opens the album, sets the tone: lush strings, throbbing rhythms, and girl-group backing vocals. Like the opener, many of the tracks, including Living Proof and After it All are like nothing Cat Power has recorded before - sounding for all the world like newly discovered Dusty Springfield recordings. While more accessible than earlier albums, the high levels of polishing and orchestration sometimes distract from or even replace the features that make Cat Power such an enduring favourite. Where previously listeners have been presented with challenging themes, songs, and arrangements, the Nashville sugarcoating of The Greatest seems like an effort to make Cat Power palatable to a broader audience. Could We, Willie, and Lived in Bars see new style used to maximum effect, and at these moments you can appreciate that Marshall probably isn't trying to repackage herself, rather she is making an album she always wanted to, a homage to music she loves. For me though, the highlights - Where is My Love, The Moon, and Love and Communication - sound more like the Cat Power of old. But then I have always been wary of change and I have always been forgiving of Cat Power, and the more I listen the album, the more familiar it becomes, the more I can see the glorious beauty of the soul sound. 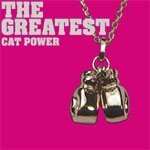 It's not what I expect of Cat Power, but, in the long run, that's probably a good thing.